We are magnetic in all that we do. The good and the bad. We are attracting everything that we are giving out into the world. What are you attracting today? Right now in this moment, if everything you were doing right now would be the only thing you did for the rest of your life, would you love it or hate it? Is it something that you want more of in your life or not? If not, I suggest ya choose again darling. Attract Good things into your life. Be an example of what the world needs, of what you need in your life and attract only that! Work hard and be your true self. When we are true to ourselves, the people and things that belong in our lives can find us! They are looking for us too! Will what you seek in life will find you by who you are being right now? Can your dreams find you with the life you live now? Are you attracting them? Be the beacon of light for all the things seeking us to be able to come and find us and stay with us for the entire time that they are supposed to. Does that mean forever? Maybe not. Does it mean when they leave that they are gone forever when they do go? Maybe not. Be who you need to be, your true authentic self, the one where circumstances, nor people change, the you that you want to be, desire to be when no one is looking, when you stop worrying about what others think, the one that makes your soul shine! Trust me when I say that the things/people/places/opportunities you need will come to you the moment you start being true to you… and that those you don’t belong will go. Be willing to let them go as well, don’t hold on to things that do no longer serve you. If it does not help your goals, if you can not be your true self around it/them, you simply don’t need it. Be You and Attract ONLY what You need in your life! and allow me to be my true self? If the answer is no, then it is toxic to your life! Whether it be toxic food, toxic people, or toxic places. If the answer is always no, then it is always poison for you to keep it there. When we stay in toxic places, with toxic people, eating or doing toxic things our lives quickly become rancid. It shows up everywhere in our lives. Our health, job, life, home, relationships all get poisoned when we allow toxins into our lives and keep them there. We have to do the work to clean it up. The cleaner we keep our lives, the cleaner they stay. Life. It’s all one thing. No one sets out to have a rotten life, toxic things build up to create that. When our lives are rancid, we attract rancid things and rancid people and hang out in rancid places. The cleanliness of our homes, our cars, our health, all reflect our mental state. Are you attracting chaos and disorganization or freedom and clarity? Rotten lives, attract rotten things, as well as those who like rotten things… like maggots. Do you want to hang around with maggots? (I know a picture of someone came to your head with that line.) Get rid of them. Like a bad smell in the fridge, start taking everything out that stinks and Clean up your life. When we clean up our lives, we give permission and courage to others who so desperately want to do the same thing but do not know where to start. Maybe that maggot desires to be the butterfly but has no room in his life to make the cocoon that he needs to grow his wings. Someone has to go first, let that be you, be an example to everyone around you! Nothing you ever do only affects you. DETOX YOUR LIFE, so that others can! Take a week off from everything toxic and use all the free time not wrapped up in toxic things as a time to do a Cleansing reset! Cleanse your mind, body, and soul! Every bad thing that you remove will clear room in your life for something FAR better! Replace bad with good, next, do it again and again, and again, over and over until the sea of bad dissolves and is replaced by a sea of good. If it is not a heck yes, it is a heck no. Figure out what it is that YOU really want. Is it a healthier lifestyle, a more abundant life, do you want to travel the world, get a new car, buy a new house, have a family, change careers? What is it? What is in your heart? What is your soul crying out to do? Write it all down, Dream Big, Not just one dream, but ALL of them, and start attracting them by becoming the kind of person that does those things! Find a mentor that you admire and do what they do. I’m not saying be a copy-cat, I’m saying watch the action they put in and make your own moves that move you forward. No one can copy exact, we all have our own little flavor and spice that we put on things to make everything nice! Set yourself up for success, don’t allow an out. We have clear the noise, the toxins, the smelly stuff to find out who our true selves really are without influence by outside things. After you write down all the things you WANT to do, write down on another sheet of paper all the things that are stopping you. List them out one by one. Awareness is the key to success in ALL things. Then remove those things from your life… ALL THE WAY. Remove them fully so they can no longer tempt you. Remember, If you want to take the island you have to Burn the boats. Stop almost doing things and 100% commit. Attract people who commit to their better selves by being one of them. our true purposes can find us! When we focus on the things in life that we want, they start to appear… everywhere! Like cleaning our house to find our keys, We have to clean out our lives for them to find us! We are always shifting, growing, learning, and moving… forward or backwards. The direction is up to us. There is no standing still when we stop we get left behind. We have the amazing adaptability gift to become what we need to be at the times in our lives that we need it, but only when we allow that to happen! When we clear the space we grow. Even a tree in the forest needs room to grow. Have you ever noticed we seem to attract a certain type of people or things into our lives, as soon as we look for them? Now, back to the jeep story… I can’t say that I saw or even noticed very many Jeeps around before I decided this grand idea. But now… I SEE THEM EVERYWHERE! Suddenly the moment I wanted a jeep, the whole world decided to buy one at the exact time! All I did was decide I want one and BOOOM they were everywhere. I did end up getting a cute red one for my son to drive and my hound dog looks extremely cute in it. Is it a coincidence that suddenly jeeps are everywhere now that I wanted one? I think not. Another example… My daughter was stung in the eye by a bee at summer camp when she was around 14 or so. Now every time there is a bee around, she fears it will sting her in the eye — Well, let me tell you that this crazy girl has now been stung in the eye MULTIPLE times now! Not only that but, she has put so much fear into bees that they literally chase her around trying to stab her in the eye, even when they are not bothering anyone else! Thank goodness she isn’t allergic. I will give a third example simply because everything comes in three’s! How about when we stub a toe or a finger, suddenly we hit it on everything for days or weeks until it heals. Surely we don’t usually hit our toes or fingers this much on a daily basis! But, boy, when we have a boo-boo, we hit it on everything known to man! We are giving that part more attention, therefore, it is attracting everything to it! We are ALWAYS magnetic! Good or bad, What are we attracting into our lives? GREAT THINGS INTO YOUR LIVES! WARNING: Great things are about to happen for you! What if we really do set our intentions each day and repeated some positive affirmations around them all day, every day for a solid week- or the rest of our lives? Write down some new thinking affirmations on some post it’s or 3×5 cards and carry them around with you and read them to yourself a few times a day and watch things change. I will list a few examples, feel free to use them or make your own according to your own goals. I am healthy, happy, and love to take care of myself. I am worth the happiness and love that it brings. Results: Suddenly you will find ways to exercise more in your day, parking at the furthest spot, taking the stairs, bicep curls, and ab crunches in the car, walking lunges to the bathroom, tricep dips or standing push-ups on the counter while your coffee brews. Not only that bur our body responds to our thoughts. You will stand taller, eyes clearer, heart more receptive to good things. You will begin to notice muscles in the mirror show up you never saw before. You will start to enjoy exercise, crave it, want it and attract people who are fit and healthy as well. Knowing you are giving yourself this healthy lifestyle as a gift puts a whole new appreciation on it. Moving our bodies, moves emotions out as well and helps our whole life to open up, our mind to be clearer, our patience to be better, our relationships more meaningful. Nothing you ever do only affects you remember. Results: Suddenly you don’t need to buy that expensive coffee or those extra things at the store that you don’t really need. 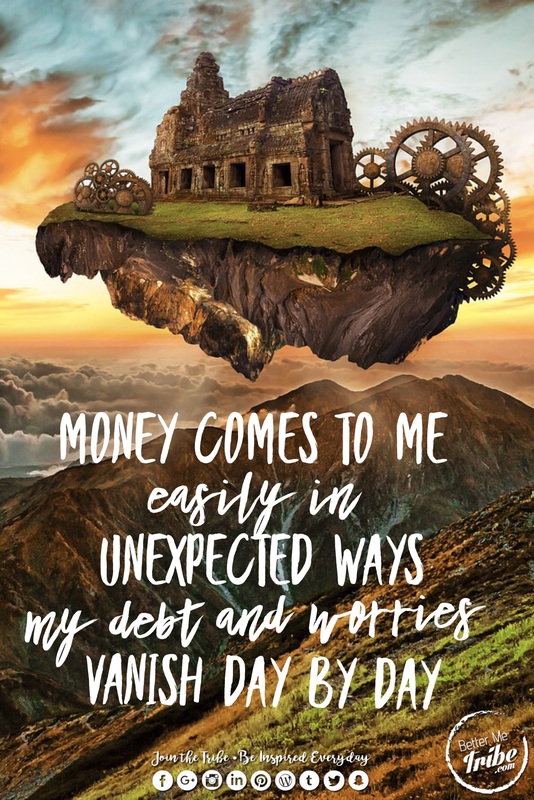 Bills become less, things break down less, warranties cover things that break, money not spent is money saved so you can start putting more into savings and save enough to invest in something that is profitable for you. Maybe even start your dream business. Your bills getting paid down is more important than having that latest, greatest, new gadget in the world that will be outdated in 2 months. You become content in all things, and things no longer make you content, owning your life and your own power do. My hubby and I have the second saved on our home screen to help us and every time we unlock the phone, we say it – aloud if possible. Every time an example of money saved, or earned, or money not having to be spent, we say it to each other. If you would like it to save to your phone click here. I eat according to my goals. Eating healthy is a gift to my body and my mind. I crave healthy food. What I eat controls my happiness. I am strong, healthy and vibrant because I choose to eat for my goals. Result: Suddenly you start making better food choices. Your body craves protein to be strong, it craves greens to be balanced, it craves the feeling you get after a healthy meal and rejects the bad foods knowing how it will make you feel afterward. You start to ask yourself before you choose what to eat… “Does this serve my goals?” Good food is magnetized to you, better restaurants show up in your life. Better choices at the grocery store. You start judging food according to how food makes you feel when you are done eating it. Will this make me feel better or worse? I am abundant, I am successful, I am strong. I am focused, I am confident. What I am doing is important and is needed in this world. Result: Suddenly you feel confident in what you are doing, you have no room for doubt, you are a powerhouse. You now know that what you’re doing is needed in the world, and you own that …ish. It is no longer a chore, but a joy. It is now your life’s mission, your purpose, the reason you get out of bed excited every day!! Your business starts to pick up, things start to move with ease, you find the balance and your business and life start to flow together- because how you do anything is how you do everything- it’s all one thing!. I am happy, I am loved, I am abundant, I am enough. What I say and do matters, and my light is needed in this world. Result: Suddenly you give yourself permission to stand a little taller, shine a little brighter, feel more confident. People notice you. Your smile beams out the light from within and are magnetized to you. People start coming to you asking what is different about you, they notice your overflowing joy. Your light attracts them to you to refill their cup’s. Your light attracts more light and multiplies, and the darkness flees from you. If you want more power and positivity quotes in your life click here to get your very own BMT Quote cards, guaranteed to enhance your life and everyone around you! You can make up your own positive affirmations as well for all the things you are trying attract into your life. Such as, learning a new skill, attracting the right partner, finding a better job, starting a new career, playing a sport, taking a test, attracting the right people into your life. Whatever your goals and dreams are, make a positive affirmation to go with them, write them down and post them all over your life. Start choosing what you attract in your life. If you have fear or doubt around something that you’re doing, sure as the world, the more you focus what could go wrong the more it will. If you are constantly worried things will start to mess up, they will. Things will start to fall apart, not because it’s not meant to be, but because your thoughts, fears, and doubt are attracting them. You’re magnetizing negativity to the situation! STOP IT! Be strong. Be confident. Be true to yourself, and true to your goals. Trust the process, Get on track, and Trust yourself, don’t self-sabotage your progress with despair and doubt and bring discouragement into your life! You and your goals DESERVE BETTER! You deserve your goals, you deserve to attract amazing things into your life. Don’t let resistance stop you. Resistance makes us stronger. But, be careful, resistance is brought on by our magnets of doubt. Turn that magnet around, own your power, turn challenges into changes and repel difficult times from you! Attract positivity into your life, and to your goals will find you. Use your internal magnet to attract or repel all things in the direction they need to go. You are more powerful than you know! Attract only what you want to bring into your life.